Two nights into prison, court officials sealed off the offices of FrontPage Africa. Ahead of the closure, a radio program that had taken to discussing this FrontPage matter at another level was effectively taken off the air and the producer barred from the station's premises (restored after 2 days). All of these actions coming within a few lousy hours show a deep dive unto the platform of disregard for dissent, abuse of free expression and a general deterioration of our democratic space. How the media and the society at large in Liberia see this, how they respond to it, and how far they go in sustaining this aggression will show the strength of the media and civil society, and how the world will see the democracy of Liberia's so-called peace years. Aside from what anyone thinks, the following issues - which obviously do not speak favorably to a free press or an enabling democratic regime - come to the fore. In other words, these actions point to a strong intolerance of dissent and criticism, and an increasing effort to limit the space for public discourses that might effectively indicate a divergence of viewpoints. Ahead of this, the Supreme Court's decision to uphold a fine of $1.5m, without ascertaining the value of the paper and or the private capacity of the owners, effectively evolves into a case of excessive fines, as opposed to the constitution and laws of Liberia(Article 21 D – Liberian Constitution 1986). But most importantly than all of the legal issues is the contribution of this particular matter to undermining the government's efforts to fight graft. Jailing Rodney and closing FPA, raised ripples that kept Henry Costa off air at Hott FM for 2 days, and sent a strong (rather frightening) signal that there is NO accommodation for exposing corruption. Reporters and Publishers, who do not see confrontation as the way forward will SHUN any story about corruption which doesn't originate from the government. Like someone said recently, the longer a regime lasts, the more repressive it becomes. As was in the final days of the Taylor reign, all of the surviving media will sooner or later become extensions of the New Liberia - adding to the failings of democracy in Liberia. Regardless of the outcome of some of these articles, they were not even reported in most other papers/media, and Frontpage provided greater uncensored space for public feedbacks. One needs not go far to arrive at the conclusion that Sieh is most likely being held for his advocacy role and his passion in pursuing corruption. By all accounts, even if we have to accept the government’s claims that it cannot interfere in the case of a judicial action - this government must show its belief in the fight against corruption by stating its respect for Front Page Africa’s contributions to the fight against corruption – even in the given case involving Chris Toe. 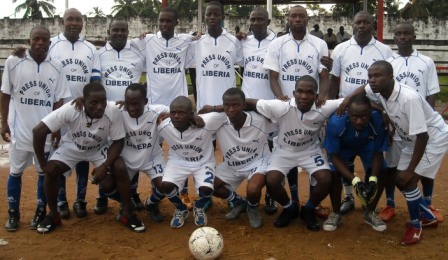 In addition, the paper has proven over and again that it is among the best in Liberia. That several of the paper’s reporters have been - on one occasion or another - recognized for national or international awards for excellence in journalism is reason for which exceptional caution must be taken in dealing with any issue involving them. I am not sure that either Chris Toe or the Government of Liberia has benefited from the widespread publicity and backlash, both locally and internationally, about the imprisonment of an anticorruption crusader for failing to pay an impossible libel fine. This is in addition to the fact that little has been done to allay public disapprobation and disappointment in the level of corruption – claimed or proven – in the given case or the government at large. In this case, the proceedings and the results have also come forth with a new round of concerns. There must be laws – new or revised - that will guarantee citizens the opportunity to pursue rights provided under our constitution and international conventions. This has to be a multi-prong assault on a flawed system, and can best work with the full participation of the legislature, which also has a significant role in ensuring that democracy works in Liberia. The issue of Justice Banks presiding over a case where his sister and brother-in-law are counsels, sprouts a deep concern about conflict of interest, and strengthens a reminder about the passage of a law that should define conflict of interest. While we are not especially happy with the delays in the passage of the law, due to various political interpretations, I again insist that Madam President has the wherewithal to define and enforce conflict of interest within her realm. Similarly, the non-political branch of government – the Judiciary - can more easily define conflict of interest within its ranks and enforce it. In a case like this, we already have 2 against one in the fight to ensure a code of conduct. By such reckoning, Justice Banks will not have to worry about people bringing his integrity into disrepute – he would already be defined by practice to stay away from certain cases. Given the cost that corruption has left on Liberia, both in terms of dollar value, political strife and socio-economic conditions, there should not be any circumstance to allow reasonable suspicion of graft go uninvestigated, and without punitive action. Anything of the sort leaves the future of Liberia quite uncertain. These comments reemphasize the government’s fight against corruption and respect for dissent and a free press. Unfortunately, the events of the succeeding weeks – whether justified by a judicial cover or an attempt to enforce respect for our institution - have seriously questioned the relationship between governmental utterances and practices. That Chris Toe - questioned by important anti graft institutions about his stewardship of public affairs and funds - can win a case written about such investigations on grounds of libel and get away with a gargantuan award and the effective silencing of a crusader speaks volumes about which side of the battle is succeeding, and makes the peace day comments inconsequential – for all intents and purpose. K. Abdullai Kamara is an influential member of the Press Union of Liberia and its outgrowth, the Liberian Media Law and Policy Reform Working Group. Currently, he is Chairman of CEMESP, Contributing Editor at The Monitor Newspaper in Monrovia,and writes occasional papers on media, governance and human rights themes in Liberia.